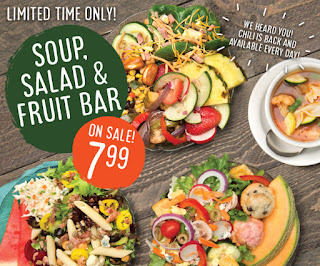 Come one, come all to our Soup, Salad & Fruit Bar, now on sale for only $7.99! While you're here, feel free to pile your plate high with veggies and hand-cut fruit, or stick to one of our fresh, homemade soups. You can also enjoy a hearty bowl of Chili – which is once again available every day! One of the best things about the Salad Bar: you get to choose what’s best for you! Hurry in because this offer ends June 22. Offer expires Friday, June 22, 2018. I love the soups and salad bar at Eat n Park. The soups are better than mine. We would like to see some type of meat added to it even if a higher price. So many of our friends say it too; that way I wouldn't even have to cook at all. Thanks for your feedback and we're glad to hear you love our Salad Bar! We'll make sure to pass along your wish for additional meat selections to our menu development team! Is there a breakfast bar? Hello! Several of our locations have breakfast buffets. We recommend calling your local Eat'n Park directly to find out about your question! Would you reconsider this change? Is this offer available all day even if we come early in the morning like 9am? Hello there! This offer is only available when our Soup, Salad & Fruit Bar is open, which usually starts at 11:30AM. It is not valid for early morning breakfast buffets.